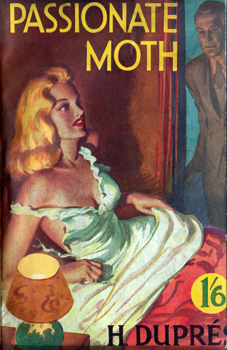 DUPRÈS, Henri – [FAWCETT, Frank Dubrez, 1891-1968] : PASSIONATE MOTH. Leicester : Beacon Publications, [1954?] First edition. About to be married to Sylvie, Rodney Cotton can’t stop thinking about the elfin chin and untamed hair of schoolgirl Ruthie in her absurdly short gym frock. A tense study of a disintegrating personality. Foolscap 8vo (18cm). [ii],5-116pp. Original pictorial stapled wrappers; spine and edges somewhat smoke-blackened; one corner slightly chewed; text ill-printed with virtually no margin in places; staple rusted, but overall a good copy. “RÉNIN, Paul” – [GOYNE, Richard, 1902-1957] : THE GIRL WITHOUT A SOUL. [Leicester] : Beacon Publishing Co., [ca.1948]. First edition. Renin with “the most modern of seductive vampires, who brings mingled glamour, tawdry splendour, and shameful disillusion wherever she goes”. Crown 8vo (18cm). 112pp. Original pictorial stapled wrappers; wrappers creased, with some splits and short tears; staples rusted, but a reasonable copy of a scarce title. No copy located in any major library worldwide. 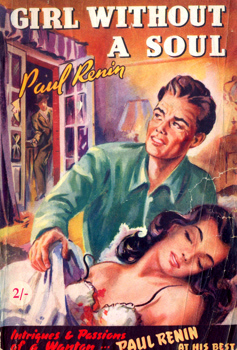 “RÉNIN, Paul” – [GOYNE, Richard, 1902-1957] : MY LIFE WITH DIANA. [Leicester] : Beacon Publishing Co., [ca.1949]. First edition. “Diana Wilton looked extremely attractive that afternoon sitting on the lounge in the smart sitting-room of her Chelsea flat and smiling across at me through the drifting smoke of her cigarette”. 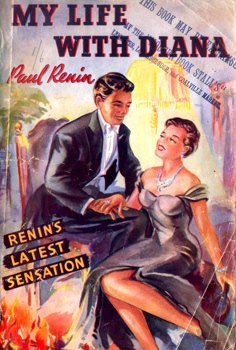 According to his publishers, Paul Rénin “knows women better than they know themselves” – suspicious wife, glamorous widow, famous actress, etc. Crown 8vo (19cm). 112pp. 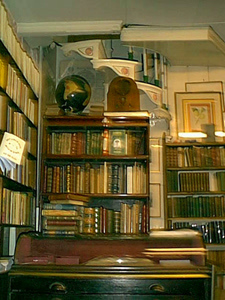 Original pictorial stapled wrappers; some wear to spine; some internal creasing; a reasonable copy of an uncommon title. Exchange stamp of the “Modern Book Stall’s” [sic] of Leicester, Loughborough and Coalville Market, on upper wrapper and final leaf. No copy traced in any major library worldwide. “RÉNIN, Paul” – [GOYNE, Richard, 1902-1957] : WILD OATS. [Leicester] : Beacon Publishing Co., . First edition. “The story of a young woman whose lover went into the army ... and what she forgave before normal life went on again”. Crown 8vo (19cm). 112pp. Original pictorial stapled wrappers – a design by Dixon; light wear and tiny splits at tips; some occasional internal spotting and tanning, but overall a very good copy.